Thomas Müller's five-goal haul at the 2014 World Cup moved him onto 10 goals in 13 games, six shy of Miroslav Klose's record. 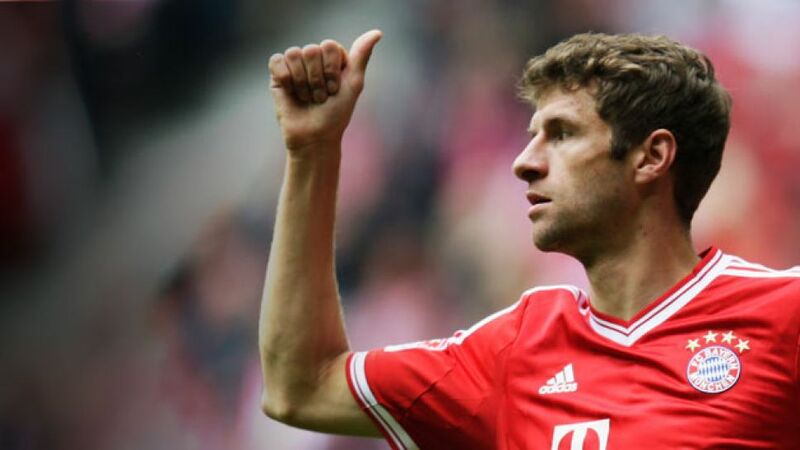 Since he took his professional bow for FC Bayern München in 2009, little has gotten in the way of Thomas Müller's inexorable rise to the top of the world game. A World Cup winner with Germany and a treble-winner with the Bavarians, the 26-year-old is already one of the Bundesliga's biggest stars. Born in Weilheim, Bavaria, Müller's first club was local outfit TSV Pähl and it was evident from an early age that he was destined for great things. Family friend Wolfgang Tuffentsamer recalls, "He stood out playing for Pähl very early on. I remember one season where we scored 165 goals, and Müller bagged 120 of them." In 2000, at the age of 11, he swapped small-town Pähl for the cosmopolitan Bavarian capital and the biggest club in Germany - FC Bayern München. Progressing steadily through the youth ranks, Müller was part of the side who finished runners-up in the U-19 Bundesliga in 2007. By the beginning of the 2009/08 season he was already on the fringes of the first team. The top-scoring German in UEFA Champions League history operates as the record champions' unpredictable Mr Versatile. Be it on the right-hand side, behind the striker or leading the line as a false nine, Müller always gives 100 per cent, but just in case you're wondering what exactly his role is, it's worth consulting the man himself. "I'm a Raumdeuter (space investigator)," he told Süddeutsche.de back in January 2011. Such was Müller's overall impact at the 2010 FIFA World Cup that he was voted Best Young Player of the tournament. He also won the Golden Boot as top scorer in South Africa, and went on to bag another four at the 2014 tournament in Brazil, moving him above Maradona himself in the all-time World Cup goalscorers stakes. Müller is an ambassador for the YoungWings charity, which provides a 24-hour helpline for children who have lost loved ones. Müller launched an advent calendar with all of the proceeds going to the charity. "I want to do alI I can to ensure the issue is taken seriously by society and that those affected get the attention and help that they need," he said. The name Müller is synoymous with goals at Bayern, and Thomas has proven to be a worthy successor to Gerd, the legendary Bomber der Nation. Müller is also the name of a famous dairy brand, and the Bundesliga record scorer teamed up with his contemporary namesake for a television ad. "The lad's fast, he's got a good technique - he's going to be a great player," Gerd told German tabloid Bild. High praise indeed from a striker who managed 365 goals in 427 top-flight outings.